HER LOVE OF animals dates to childhood. Sheba is her sixth Labrador pup. Two Los Angeles Zoo docents were honored last month for their 50 years of service, a milestone achieved by a select few dedicated animal lovers and educators. Local resident Kilbee Brittain and Amy Callister, of Pasadena, were honored at a luncheon where they each received a Mayor’s Certificate for unwavering commitment and dedication to the Zoo, its animals and the education of its visitors. After all these years, Brittain says she still loves going to the Zoo. The certificate? Not so much. “I don’t think I’ll hang it up. There are too many of these official thank yous,” she told us last month at her S. Irving Boulevard home. 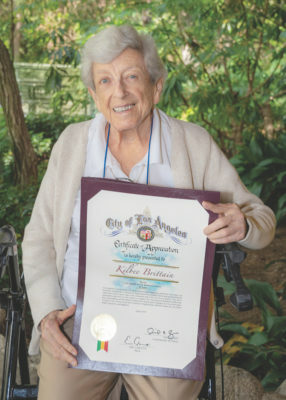 As a child growing up in Fremont Place, she watched as her mother, the late Adelaide Kingman, was showered with praise for her community work. She also remembers her stepfather, Howard Kingman, a retired vice admiral who served in the Pacific Theater during WWII; he would drive Brittain and her friends to Marlborough School. “He once told us he learned more in two weeks driving the Marlborough carpool than in the war…. from the giggling and the talk and the gossip,” Brittain said. She’s always loved animals, and counts trips to India (several times) and Vietnam among her many travels. She’s less mobile now since she had a stroke seven years ago, but she remains among a select group of more than 30 docents who have served for more than 30 years, said Ashley Rodgers, Zoo spokesperson and a Hancock Park resident. KILBEE BRITTAIN received the Mayor’s Certificate for 50 years of service. Brittain’s education also has come in handy in teaching docent classes the past several years. After Marlborough, Brittain went to Stanford and earned a Ph.D. in English Renaissance literature from UCLA. She taught third graders in the Philippines, and upon her return was appointed a member of Marlborough’s Board of Trustees; she also was a member of the Alumnae Council, editor of the school magazine and leader of a Shakespearean seminar. She and her late husband M.L. (Marion Luther) Brittain III were busy raising four children on Irving, and Mrs. Brittain was already working as a volunteer at the Zoo when she was featured in the 1971 Larchmont Chronicle Women of Larchmont issue. She also found time to be a member of the Museum Alliance of the Natural History Museum, but it was at the Zoo that she signed on for the docent training and would soon be drawn to primates. “They are our closest relatives, and I’m very interested in people’s self-analysis and our place in evolution. I don’t believe in the Biblical account,” she said. Most people know about animal behavior from television shows, “but if they take a primate class they often get hooked,” she added. Another class in her docent teaching repertoire is the domestication of animals. Research has shown there’s a strong bond between canines and humans, which Brittain can attest to first hand. Sheba is her sixth Labrador retriever. As a child, her family had a Great Dane, and soon five puppies. Actor Henry Fonda came to her Fremont Place home to get one. “My dad was a screenwriter,” explained Brittain. She was four at the time, and she told the actor, “he was the most handsomest man I’ve ever seen!” to her mother’s chagrin. She doesn’t get to the Zoo as often as she’d like anymore. Her helper of many years, Dolores Ascencio, drives her. And while the Greater Los Angeles Zoo Association (GLAZA) started its annual training last month, there are educational opportunities available to the public all year long, Brittain said. “The docent program is for people with an interest in wildlife, a love of learning and the desire to make a difference in the world,” added Docent Chair Paulette Heath. “It is hard to have a bad day at the L.A. Zoo. Every day I see something new like tigers swimming or chimps interacting with guests. “It’s fun to talk to guests about behavior and adaptations as well as give a voice to the conservation mission of the Zoo, as its staff members help visitors of all ages understand how important the Zoo’s work is to wild animal populations around the world,” Heath goes on to say. Docents complete a 23-week training program that includes lectures, tours and behind-the-scenes visits offered in conjunction with UCLA Extension. Classes, which run through March, meet once a week and focus on taxonomy of both the plants and animals at the Zoo as well as ecology, conservation and the role of zoos in wildlife preservation. Full descriptions of volunteer and docent opportunities and requirements are available at lazoo.org/volunteers and general information is available by calling 323-644-4702. See also docents@lazoo.org. What a nice article about a lady I’ve never met, yet heard about all of my life. Mrs. Brittain and my aunt, Laude Hill, nee Neff, were classmates at Marlborough, class of 1949. 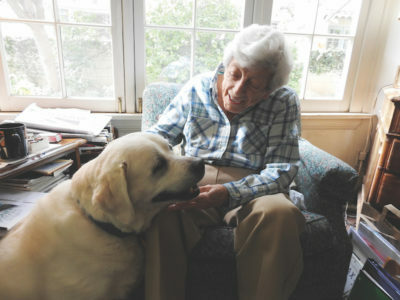 Congratulations to her and to the Larchmont Chronicle for a great story that is well written and enjoyable reading.